Designed for farmers and tough conditions. The mains motor is double insulated and features a ventilated head and a built in overload switch. The mains version has a 5m cable and a moulded-on plug. An optional clipping head is available for versatility. Ideal for dagging or for smaller flocks. Comfortable to hold and easy to use. Designed and manufactured in Britain, Lister is known worldwide for its quality and is holder of the Royal Warrant. 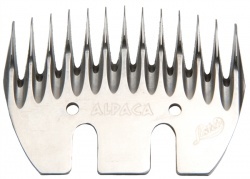 We Say: We love the Lister quality and this shear is ideal for anyone with a small flock. It's amazing value for money!